Does Your Organization Need STEM Mentors? 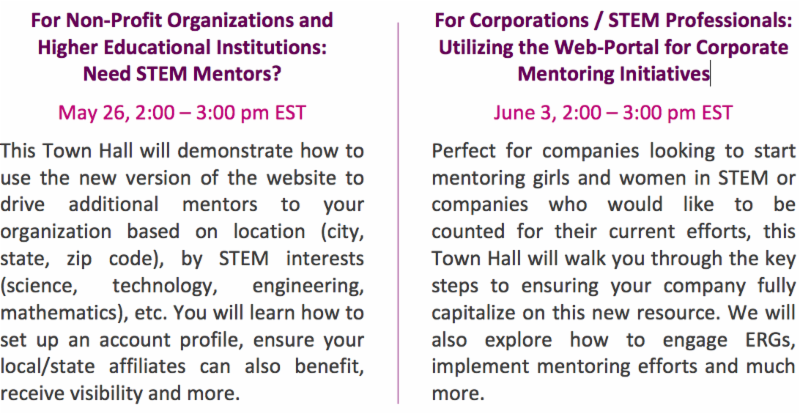 During these two calls, Million Women Mentors will offer a strategic overview of the movement, including our five suggested pathways to mentor, an update of the State of the States (30 teams mobilizing across the nation), and a deep-dive on the new MWM web-portal, powered by Tata Consultancy Services. Hope you can join us for whichever call is most aligned withy our needs. About Million Women Mentors: An initiative of STEMconnector, MWM is a collaboration of companies, government entities, non-profit organizations, professional associations and state leadership teams to advance girls and women in STEM careers. This initiative drives mentorship for girls and women ages middle school through careers in science, technology, engineering and mathematics. Launched in January, 2014, MWM already has 60 national partners reaching 30 million girls/women, 30 major sponsors, 30 state leadership teams and 250,000+ pledge commitments to mentor.